Japan is home to one of them more interesting woodland ferns – the so called “upside down fern”, Arachniodes standishii. This medium sized fern is neither common nor rare in my neck of the woods, but is always a welcome sight, especially in June when the newly grown fronds grace the banks of streams and coves of cedar trees. 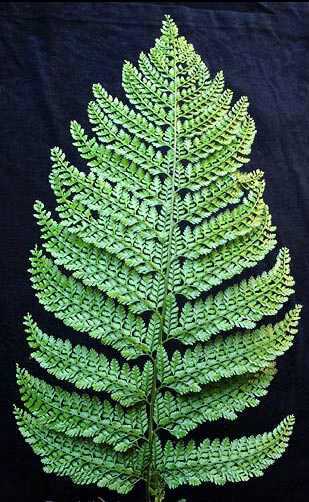 A. standishii is fairly large evergreen fern with fronds that can exceed 60 cm, but usually are no more than 50 cm. The broad blades are 15-20 cm across. The fronds are three times pinnate and a pleasant rich green color. The stipe is relatively short (no more than 20% of the total frond length), and has brown scales at its base. The pinnules of are more heavily veined on top then on their lower surface and they hang down giving the frond an upside down appearance (hence one of its English names, the upside down fern). The mature frond of Arachniodes standishii is 3 times pinnate and feathery looking up-close. The sori are kidney shaped and mature spore a rich red-brown color. The rhizome is short, creeping, and occasionally branching. 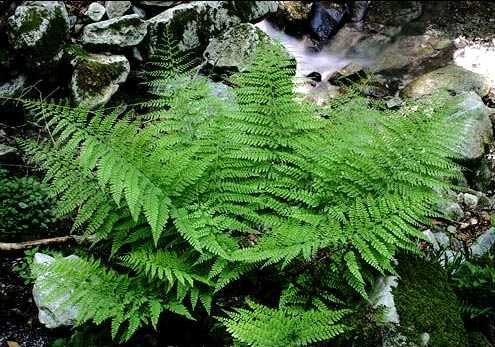 This species can form dense colonies, but commonly occurs in association with other types of fern in sporadic clumps. Being found throughout Japan’s main islands and South Korea, this species seems indifferent to temperature. It favors moist to wet woods, often along streams, and especially conifer plantations where it can form extensive colonies. This fern seems happiest on wetter sites in light to deep shade at mid to moderately high elevations (~300 to 800 m) in Kyushu. Arachniodes standishii in habitat, Sefuriyama, Fukuoka Prefecture, Kyushu, Japan. 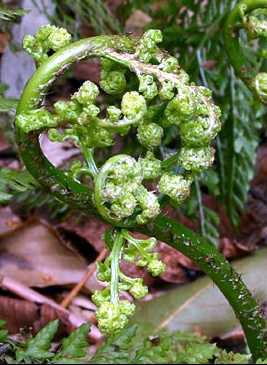 The crozier of Arachniodes standishii is very intricate, belying the structure of mature fronds. Here is a delightful fern worthy of being grown in any garden. Its delicate 3-pinnate fronds give it an airy and at the same time full appearance. Add to that, each pinnule tends to hang down and is well veined on the upper surface creating an even more interesting appearance that is hard to describe but unmistakable in person. The plant can be rather large when growing in wet forest or along water courses. I know of one population that occurs in a valley of Cryptomeria plantation forest where it has gone positively wild growing nearly in pure stands. Further up valley in a more natural forest it still thrives, but seems to have more competition from other ferns. It is locally common, but in my experience it is overall rather infrequent in the Fukuoka City area. Arachniodes standishii mature spore are red-brown. This fern can be grown with little difficulty. It likes a nice shady spot in the garden with plenty of moisture. In fact I don’t amended the soil at all, and my plant hasn’t missed a beat. In Kyushu it remains totally evergreen, but apparently can live in much colder climates being cold hardy to Hokkaido where it is likely to defoliate. It does seem to dislike dry conditions, so water it frequently or the fronds can get crispy. I would imagine it is hardy to at least USDA cold hardiness zone 6 and probably lower. Though fairly large in stature it is not invasive, so it is a good companion plant for woodland perennials. The Japanese name, ryoumenshida, means “both sides fern” from ryoumen (“both sides”) and shida (“fern”) since the upper surface of the pinnae are strongly veined and bend downward, making the upper and lower frond surfaces look similar. The English name, “upside-down fern”, is so named for the same reason, you’re not sure which side is up! 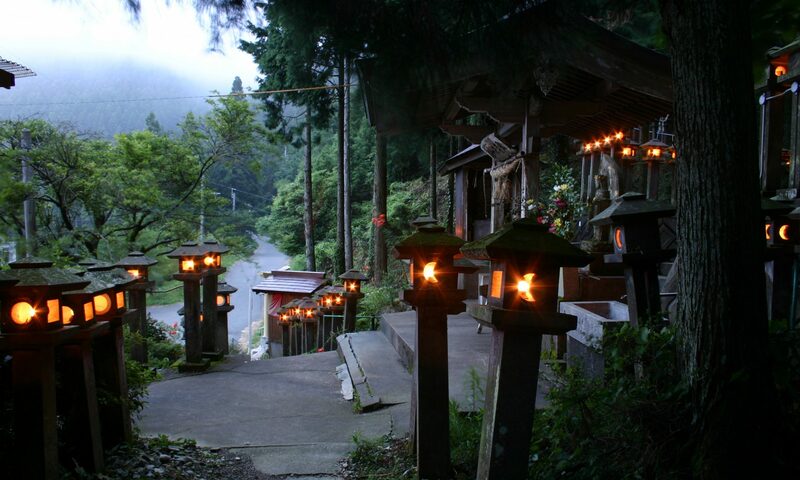 It is cultivated throughout the world, yet remains a bit scarce. If you are a fern lover I highly recommend finding one – you won’t be disappointed. Arachniodes standishii is often found growing near streams or wet seeps. in two weeks. I have time only for an hour or so walk (from my tour bus) but will enjoy every moment. Thanks for bringing us this little bit of paradise. Hey Brent, what day are you going? I’ll be there the 11th of November. I hope the leaves are as stunning as they were the last time I went in the fall. Maybe we’ll cross tracks. I was wondering, would you consider this plant as deer resistant? To be honest, I don’t know. We do have a lot of deer around the hills here and I haven’t see evidence of them being eaten. I took some photos of one of these ferns several years ago, during a hike in rural Gunma, Japan, and wanted to know what it was. Finally, your website helped me find it. I just want to say thanks! You are welcome. This is a really beautiful species.